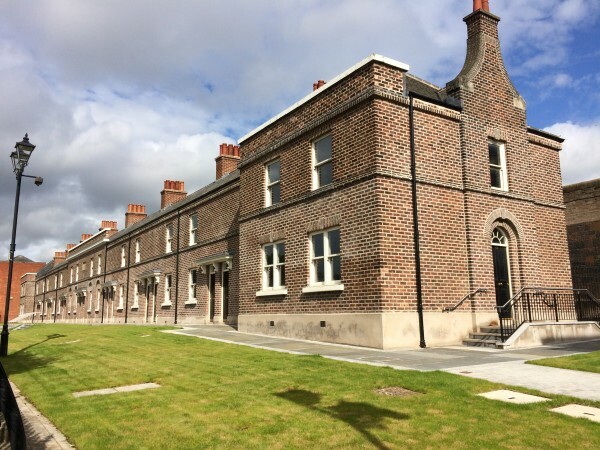 The restoration project involved remedial works to the Wardens' Cottages, located adjacent to the Crumlin Road Gaol in Belfast. The scope of this project was to provide structurally sound and weatherproofed buildings, in order that they would be safe for Office of the First Minister and Deputy First Minister (OFMDFM) to carry out a total internal refurbishment in the future. Refurbishment of the existing slated roofs and associated lead flashing, etc. Replacement of all defective roof timbers, inc. rafters, boarding, battens, gutter and valley boards etc. Refurbishment of external walls including structural upgrading of the front and side cavity walls. Dismantling and rebuilding of parapet walls. Replacement/installation of Foul and Storm sewers and service runs to the rear of the Cottages. Demolition of miscellaneous walls, outhouses at the rear of the Cottage. Repair/replacement, re-pointing and cleaning of all brickwork facades. Repair/replacement of all rainwater goods. Removal of redundant tank house from the flat roof to the rear of the building. Replacement flat covering and any associated defective roof structure at the rear of the building. Dismantling and reconstruction of existing chimneys and reconstruction of missing chimneys to match original inc. new pots. Replace missing / defective floor joists, floorboards and making safe all internal staircases. Removal of existing security lighting fixed to the rear elevation. Installation of new lighting columns within the rear alley to replace redundant security lighting. inc. PVC ducts and manholes. Provision of three phase mains electricity supply to the facility complete with Distribution Board and ‘temporary’ 110v lighting throughout the facility. Installation of a silicone injected dpc and miscellaneous waterproofing and damp control measures to the external envelope. A bit more information about the the Wardens' Cottages project.